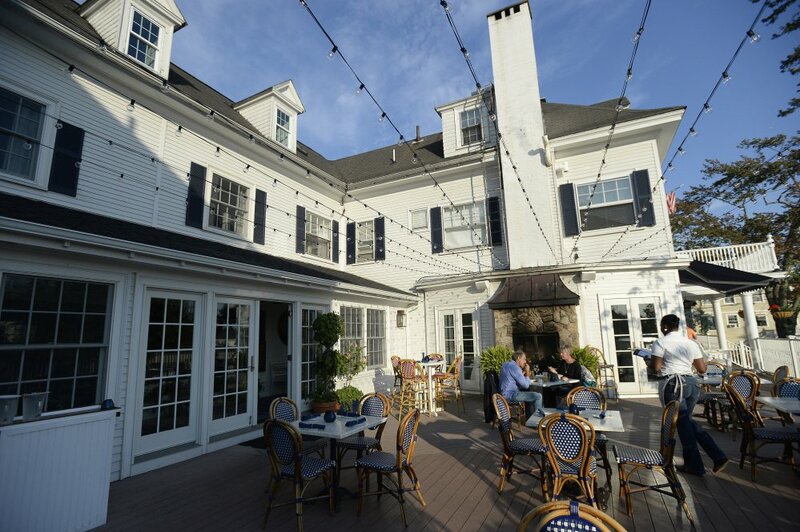 And this is not good news for the revamped Kennebunkport restaurant. Our server is bombing. She does not seem to notice. She also doesn’t seem to notice the table next to ours, where a couple out celebrating their anniversary is sitting, trying to catch her eye. When they finally do, they’re kind. “I’m really sorry to bother you, but it’s been more than an hour, we haven’t ordered, and all we’ve had is water,” the woman says, smiling generously. “No problem,” our server says, as she walks away and returns minutes later with a tray. On it: two more glasses of water. RESERVATIONS: Yes. Booking via OpenTable recommended to avoid excruciatingly long phone-wait times. BOTTOM LINE: The Burleigh, an upscale casual restaurant in the recently redesigned Kennebunkport Inn, is a stylish space, with plump, precisely karate-chopped throw pillows and chic, comfortable seating throughout its three dining rooms. Just like many of its clientele, it looks put-together. Order a drink or a meal, and you’ll discover another side to The Burleigh – a rather less organized one. Drinks are hit-or-miss. 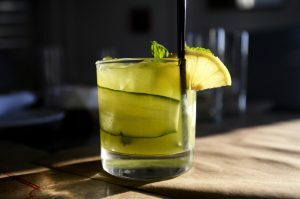 The best, the astringent, Pimms-based Circa 1823 ($12) and the smoky, spicy Perkins Line cocktails veer toward drier flavors, while sweeter cocktails are frequently suffocatingly sugary with little nuance. Food is similarly uneven, with some gems, like a buttery, gorgeously grilled peach cobbler and stunning hot-smoked Jamaican jerk chicken wings, counterbalanced by some clear losers. Chief among them: a bland, very beige skillet of fried cauliflower, hummus and tahini; and a pork tenderloin that could double as a teething ring. Service can be friendly and attentive, or utterly neglectful, depending on your server and his/her mood. So if you visit, come prepared with a backup plan. You may need it. They laugh, exasperated. I laugh, commiserating. We’ve also been sitting, abandoned with our menus for 20 minutes. Fortunately, we ordered cocktails at The Burleigh’s outdoor bar before we were seated, so we’re not quite as desperate as our neighbors. One, the Perkins Line ($13) with vodka, pineapple and chipotle simple syrup is excellent – tropical and tart, with a slow attenuation of spicy heat. Two others are sticky sweet. The first, the KPI French 75 ($12), named after the Kennebunkport Inn, where the restaurant is housed, comes blended with gin, prosecco and far too much lemon-verbena simple syrup. The second, the Billows ($13), is made with so much sweetening mixed into the mint and cucumber shrub that crystals of sugar precipitate out of solution. A few minutes later, the floor manager arrives with a flourish at our table. “OK, people, talk to me,” she commands. “I heard you were upset because you were waiting a long time.” We look at one another, confused. None of us has left the table to complain. “No. That’s us!” calls the well-hydrated woman at the next table. The manager swivels to placate them with a few free appetizers: onion strings ($7) made with shaved, curry-dredged Vidalia onions, rubbery Green Goddess deviled eggs ($5) filled with an overwhelming quantity of capers and cornichons that annihilate the flavors of parsley and tarragon in the yolks, and a first-rate take on poutine ($9). Executive chef John Shaw (who holds the same title at nearby Tides Beach Club) developed his cast-iron roasted version as a way to showcase Maine ingredients, from Pineland Farms cheese curds to housemade lobster gravy to the smashed fingerlings that replace french fries. On a second visit, I saw what he meant. The band was halfway through an off-key rendition of “A Whiter Shade of Pale” when we arrived. Half a dozen Kennebunkporters of a certain age were swaying unsteadily on the deck, one with a tambourine. Within a few minutes, I realized that nearly everyone in the place was tipsy. The woman waiting for the 50-seat restaurant’s only bathroom tipped me off as I watched her pilfer K-cups intended for guests of the hotel, dropping half of them on the carpet. Not long after, my hunch was confirmed by a diner from New Jersey who weepily told my dinner guest about her sparkly Sept. 11 commemorative candles, all the while holding tight to his shoulder and complimenting his salt-and-pepper hair. It was like a scene from an ABC After School Special about booze – except a cautionary tale meant for tony locals and tourists. I decided to go easy on the alcohol, opting for a glass of the Drumheller chardonnay ($11 glass/ $42 bottle). Full of stone fruit and citrus, it makes a great match for the lobster club sandwich ($20). Well, really a lobster BLT, but with tons of fresh tomato, thick-cut smoky bacon and very lightly mayonnaise-and-lemon dressed lobster, I didn’t miss that third piece of toasted white bread. On the other hand, I was stumped by the french fries. The Burleigh hand-cuts potatoes from Green Thumb Farms in Fryeburg, and while they were cooked crisp and golden, all but one was under an inch long. They looked like scraps. Another deep-fried dish, the “fried chicken wontons” ($10), was also a let-down: filled with a ground white meat-and-mirepoix paste and served with a too-acidic dipping sauce as unbalanced as the patrons on the sundeck. 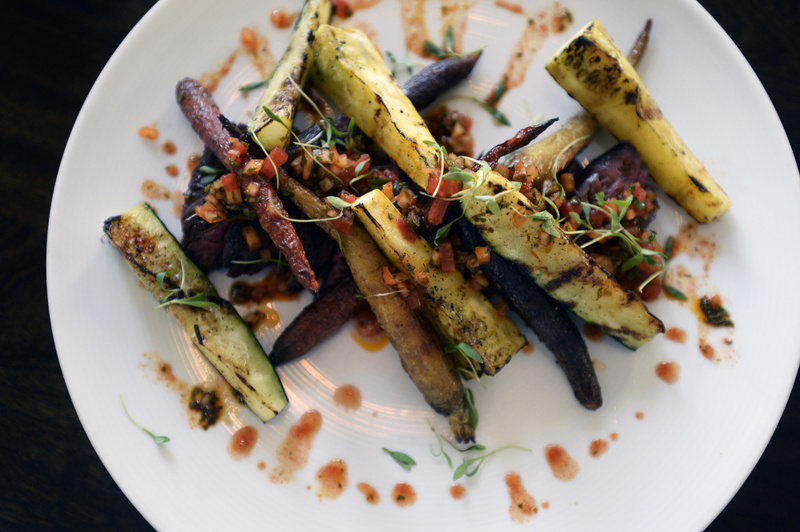 Hanger steak is served with rainbow carrots and grilled summer squash. Indeed, equilibrium and execution are problems across The Burleigh’s menu. In the roasted chicken ($29), you’ll find luscious confited thigh meat amid local Hen of the Woods and oyster mushrooms and patty pan squash. Right next to them sit pieces of desiccated roasted breast and an unbearably acidic and thyme-heavy Italian salsa verde. Then there’s a tight, almost elastic (not to mention expensive) angel food cake baked in the wrong pan and topped with berries ($10); a gritty arugula salad with a sugary Champagne vinaigrette; and local day boat scallops served with bacon-braised greens and almonds ($32) that is drizzled with a confectionary-sweet agrodolce reduction that makes the dish taste like a seafood dessert pudding. I got my hopes up for the hanger steak ($30) with duck fat-roasted rainbow carrots. Served with grilled summer squash and a chimichurri-style sauce of parsley, garlic and lemon zest mixed with very finely chopped tomatoes, it showed off a fantastic range of flavors and textures. Both times I ordered it, though, it was plagued with execution (and service) problems. Once, the squash was underdone, still raw in places and just barely grill-marked. On both visits, the steak was cooked past medium rare and, puzzlingly, served without a much-needed steak knife. A few dishes were unredeemable. One, the beige-on-brown skillet of fried cauliflower with garlic hummus, black sesame tahini and yogurt ($13) was flat and bland, despite the promise of Turkish Urfa pepper seasoning. Another, the pork porterhouse ($26), was accompanied by a scarcely seasoned charred corn-and-black-bean relish of peppers, lime and green tomatoes. Worst of all was the pork. “It’s served medium,” our first server warned. A few bites in, I wondered, “Medium what?” It was like eating an old saddle. Yet a few dishes show promise, like a grilled New Hampshire peach cobbler ($10), topped with a toasty browned layer of oats, brown sugar and butter, and a generous scoop of basil and tarragon mascarpone cream. Or straightforward, satisfying blackened cod tacos with shaved cabbage and a subtle, smoky charred tomatillo salsa ($10). Even better were the juicy, vigorously peppery house-smoked jerk chicken wings ($11). “We don’t fry them. We rub them and marinate them and hot-smoke on a little smoker that lives out back,” Shaw said. Our server said very nearly the same thing, adding that The Burleigh’s chefs love to cook on it. “I think because it gets them outside. You know, away from the chaos,” he said, laughing and gesturing towards the kitchen, where moments before we had heard the evening’s second stack of dishes crash to the floor. I had no doubt he was right.